Get the latest news from the world’s biggest science lab! All the facts, all the truth, totally verified and true beyond all reasonable doubt. 85% official news. Brought to you by the team that revealed Elvis landing on the moon. The ATLAS detector is currently the largest experiment on the CERN site, weighing over 7,000 tonnes, spanning 50 m across and almost 50 m long. 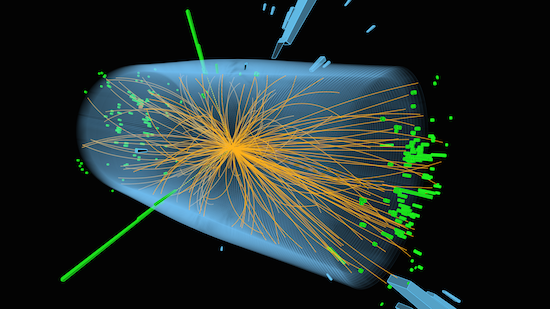 It can detect nearly all particles produced in the record breaking high energy collisions provided by the LHC. These particles have strange names like the electron, proton, pion, Ξ(1530)3/2+, photon, friton, demi-semi-lepton and Boris. But there is a big problem, which becomes more pressing as we reach higher and higher energies, and that is the neutrino. This is a tiny, neutral, almost massless particle that was predicted in 1930, and it comes in different flavours (the most popular being mint.) The ATLAS Collaboration has an ambitious plan to extend the capabilities of its detector by being the first such general purpose detector to install neutrino calorimeters. 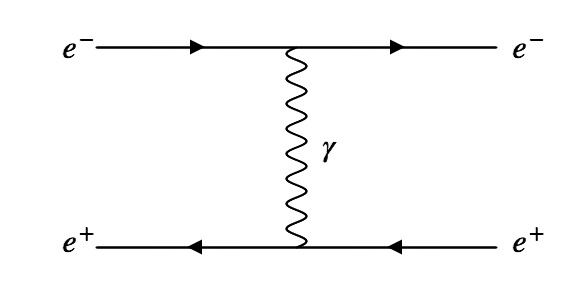 At the moment a neutrino is seen as “missing transverse energy”, and that makes it really hard to find new particles. ATLAS Spokesperson, Dave Charlton, said “Look I really don’t have time for this, I have to go to a meeting!”. 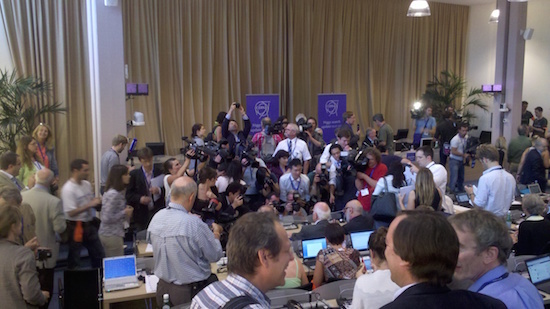 After reporters blocked his path and stole his CERN card he added “Fine, how about ‘This is a very exciting time for ATLAS and we are happy to be leading the field in this area. Detecting neutrinos will open up new parameter space and allow to perform searches never seen before.’ Now give me my CERN card, the Weekly meeting cannot start without me.” By seeing neutrinos directly, physicists would be able to observe the annoying neutrino backgrounds that get in the way of dark matter searches. They could count the neutrinos directly to see if they agree with long standing predictions. The proposals, if approved, will be implemented by 2600. For decades the CMS Collaboration has used a common tool known as “truth matching” with its simulation studies. Every particle in a simulation has information associated with it, including its mass, energy, charge, momentum, spin, and favourite movies. All these quantities have to be estimated using measurements from the simulated detector, so they are never perfectly known. However with a simulation you can match up the particles to what really happened with the so-called “truth record”, and this is what we call truth matching. If you have a particle travelling with a certain momentum in a certain direction you can compare it to the truth record and find out exactly what kind of particle it is. That means you no longer need those tricky identification algorithms, and you can remove background processes trivially. 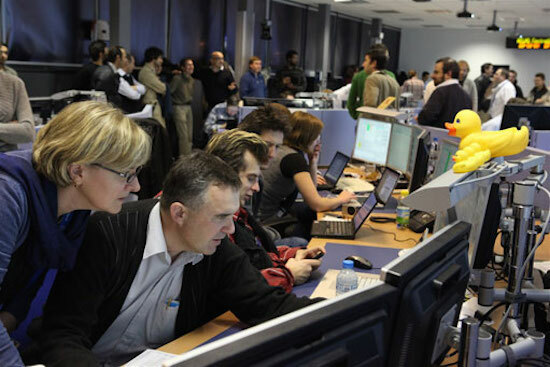 If the truth matching of data is successful, it could lead to a revolution in particle physics. Detectors could be slimmed down, time could be saved in the analysis process, and the peer review process would be streamlined. 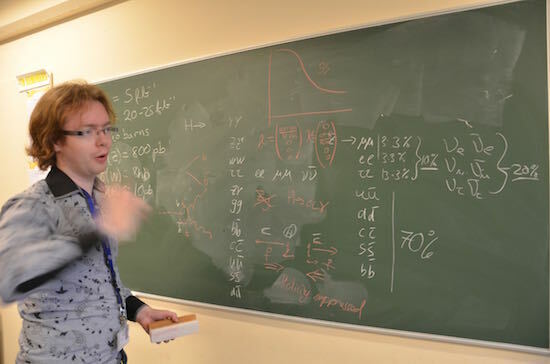 “Rather than having to measure the levels of signal and background, a process that can take months, we can simply count how many electrons bosons we have.” The initial findings are only the first step, and there are plans to extend the data truth matching to more complex final states. 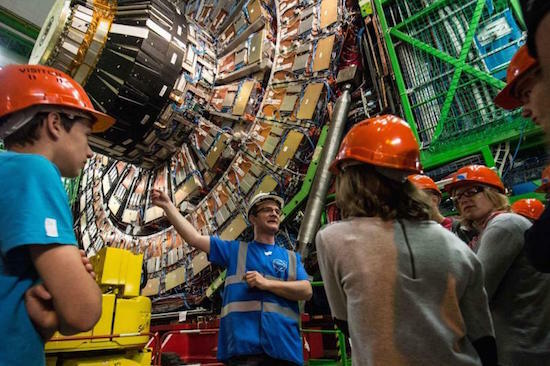 It’s expected that by 2019 the CMS Collaboration will be able to truthmatch Higgs bosons, top quarks, and even new particles we’ve never seen before. 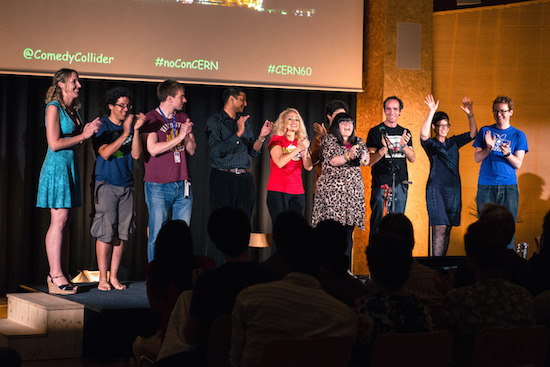 LHCb made a big blunder, and you won’t believe what it is! 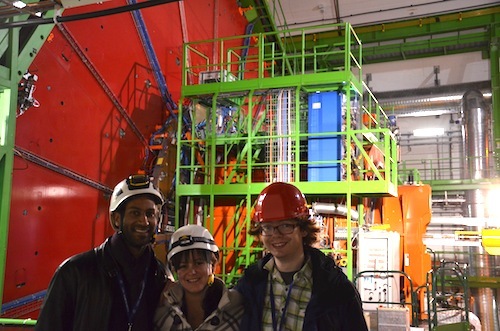 Senior LHCb physicists were left red faced today when they discovered a terrible blunder. “How could we not have seen this?” Spokesperson Guy Wilkinson said. “It’s been staring us in the face for years” blurted Operations Coordinator Barbara Storaci. Can you see what’s wrong with this picture? 98% of people can’t! 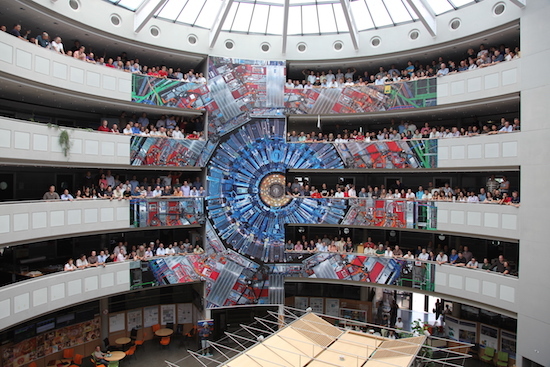 It turns out that when LHCb was made, the engineers only built half a detector. “Now I see it I can’t unsee it!” exclaimed a postdoc, spilling crepe on the table as he spoke. “It may be true that we only built half a detector”, an anonymous researcher said “but at least it was the forward half.” So far there are no plans to correct the problem, and the Collaboration has already produced hundreds of world class papers with the current detector and shows no signs of stopping. A team of alchemists working on the ALICE Collaboration have today announced that their research program will end today. The collection of six pesudoscientists, a small minority of the total Collaboration, are hanging up their lab coats after declaring their research “unworkable” and “a total abysmal failure”. 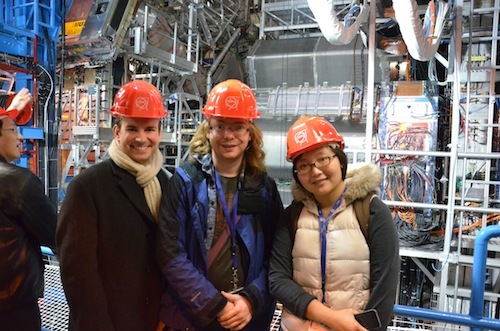 The ALICE Collaboration investigates the collisions of Lead ions with other particles in the LHC. 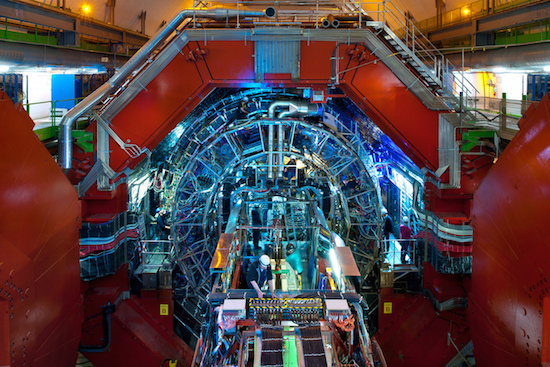 The Collaboration has been responsible for a wide range of discoveries concerning the quark-gluon plasma, which is a form of primordial matter from the early universe. However it is not the quark-gluon plasma that the small band of alchemists are studying. 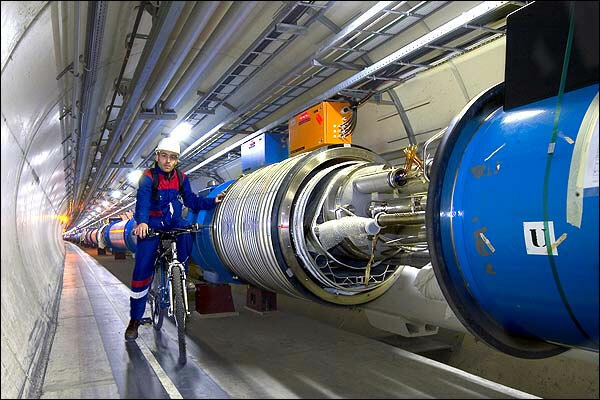 Instead they want to turn the Lead into Gold, and they want to use the LHC to do it. Most of them came from the previous generation of ion collider experiments, based in Brookhaven, New York. At those facilities there was an abundance of Gold in the experimental apparatus, and it the alchemists looked to replicate this success. Some magnets are more useful than others. Magnets with mini thermometers can help engineers keep track of the state of the supercooled LHC magnets. The resident artists at CERN have expressed an interest in the magnetic “fridge poetry” packs. Magnets that feature cats will be used in the RF cavity sector. 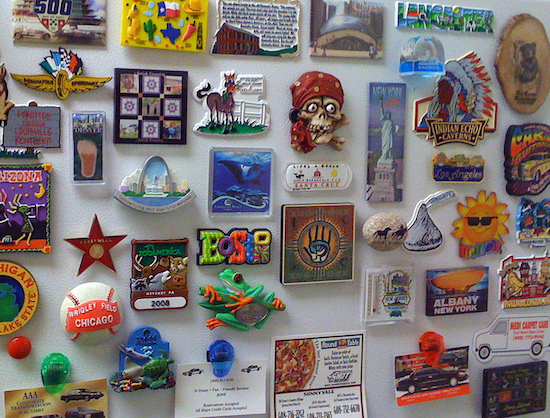 So please, take a look at your fridge, and see if you really need that snow globe magnet from Oslo, or that hula girl magnet from Hawai’i. Why leave it sitting in your kitchen when it can be helping research on the world’s largest machine? 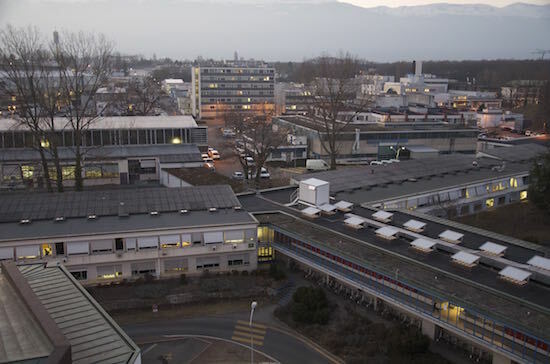 Teams of administrators, including Gianotta herself, have been seen walking the corridors of CERN and instituting this new policy. 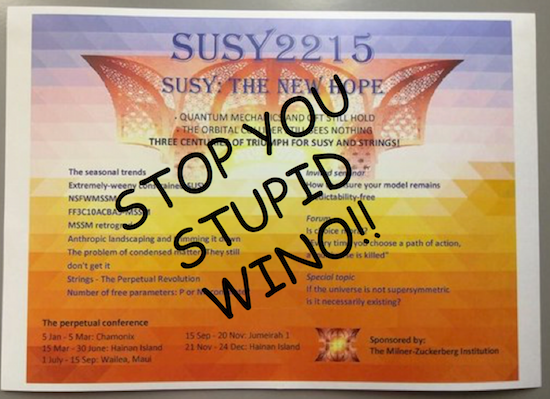 Posters announcing a SUSY conference have had “NO MORE SYMMTRY BRAKING HERE! !1!” scrawled across them, and a poster advertising a symposium on solar neutrinos was subjected to “Go back to where you came from. The sun.” written on it. Even parking signs are not immune, with slogans such as “Parking? More like… splarking!” and a fire exit sign was seen with a neatly written note underneath saying “They had fire in Hitler’s Germany too, you know”. The real hero of the story is their chicken, Captain McNuggets, who made the characteristic “chirp” sound. So did LIGO really detect gravitational waves? “Oh, absolutely!” the pair of students replied. 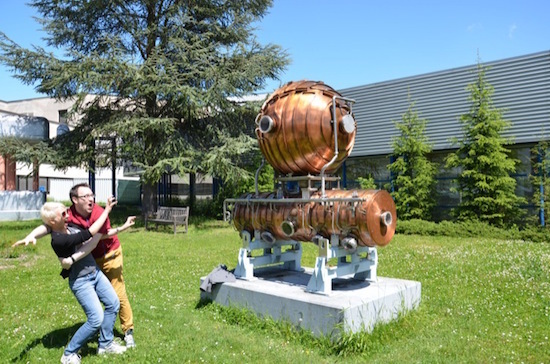 The machine they made could produce gravitational waves of any frequency and amplitude desired, but it was only made “for a bit of a laugh” and is unlikely to see further research. The machine itself was dismantled in October to make space for their latest project, the “ballistic taco-launcher”. 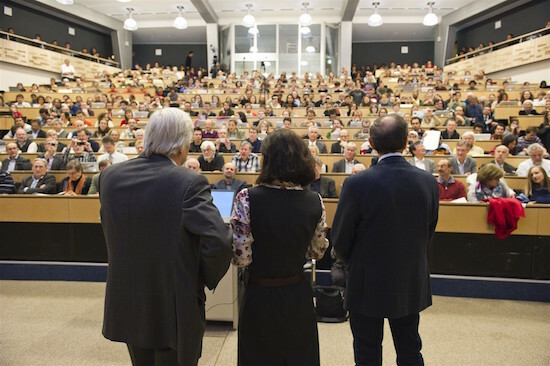 After a three week review CERN Director General, Rolf Dieter Heuer has announced that the LHC will not have another run and that the international laboratory will be closing its doors to science. The revelation follows an intense week of discussion, analysis and rumour mongering. It turns out the rest is history, because these few exobytes of data held the answers to all of the open questions of physics. 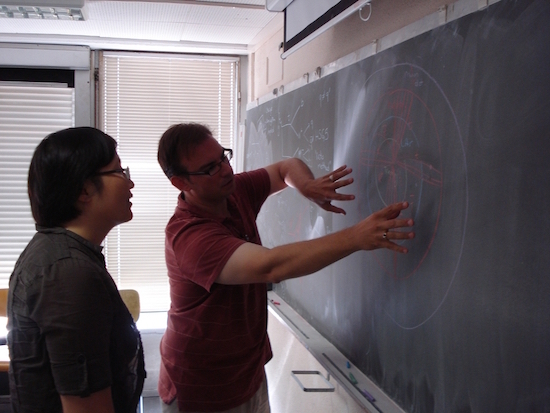 After discovering a staggering 327 new particles the physicists managed to prove the existence of supersymmetry, extra-dimensions, dark matter, micro black holes, technicolor, and top quark condendsates. But not string theory, that’s just silly. The situation for unviersitities across the world is less clear. PhD students are expected to have up to seven theses each to cope with all the extra discoveries. Professors are starting to panic, trying to save as much of their funding as possible. 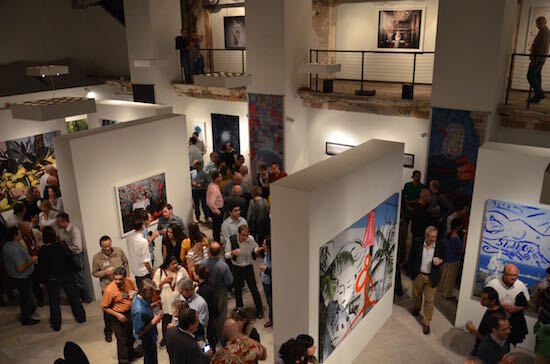 There has been a sudden increase in the number of conferences in Hawai’i, Cuba, and the Bahamas, as postdocs squeeze as much opportunity out of the final weeks of their careers as possible. Famous atheist Richard Dawkins as leapt on the opportunity to prove the non existence of god. 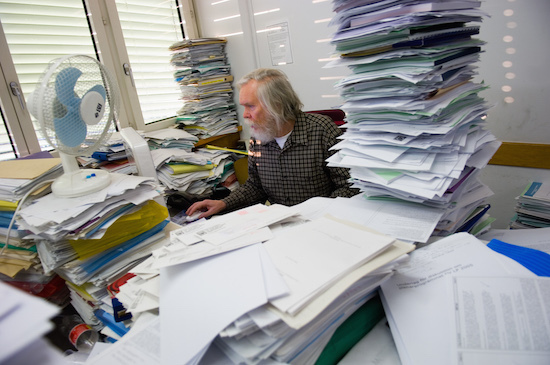 “If those files answer all the questions physics has left then surely it proves there is no god.” he tweeted last week. And he’s not alone. Thousands of people across the globe are finally realising that with no questions left to answer, they are completely intellectually and spiritually satisfied for the first time in history, and are busy validating their own world views. Among the top answers are the following: Schrödinger’s cat is alive and well and living in Droitwich, god plays dice on Tuesdays, light is a particle and a wave and Canadian (and hopes you’re having a good day), electrons are strawberry flavoured, Leibniz and Newton were good friend who discovered calculus together, and if you could ride a beam of light it would be totally freaking awesome. It’s unclear what will happen next. There are certainly questions about how best to use the extra dimensions, but the biggest problem is a social one. Nobody knows what will happen to the thousands of physicists who will have to re-enter the “real world”. It’s a scary place for some, and physicists lack basic transferable skills such as burger flipping and riot control. Whatever happens, everyone will look back at the Winter of 2015 as most exciting year in science history. 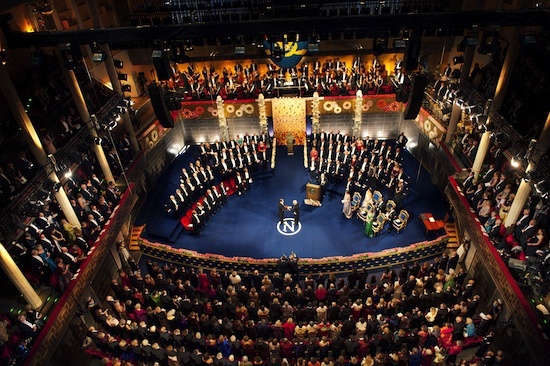 This year’s Nobel Prize ceremony will be a complicated matter indeed. 1. Some people think that physics is exciting. 2. They say “There’s nothing like the thrill of discovery”. 3. But that feeling won’t prepare you for the real world. 4. Discoveries only happen once. Do you really want to be in the room when they happen? 5. 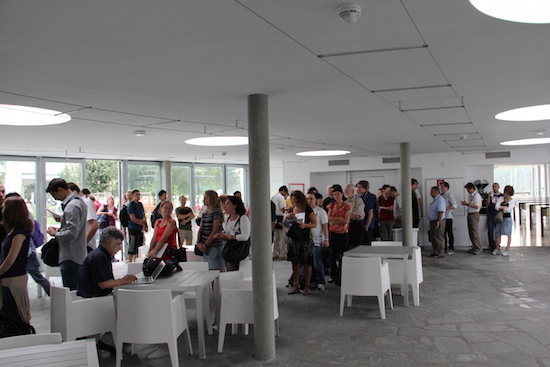 It’s not as though people queue overnight for the big discoveries. 6. 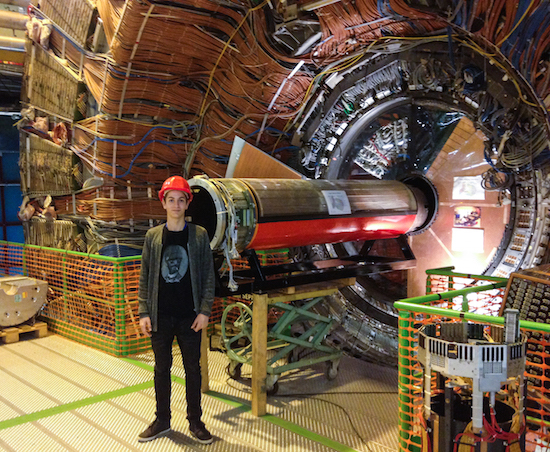 CERN’s one of the biggest labs in the world. 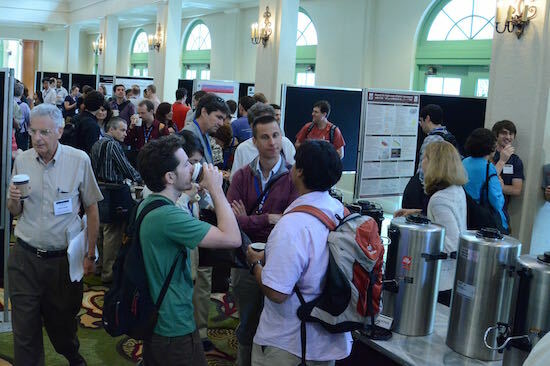 It’s like Disneyland, but for physicists. 7. The machines are among the most complex in the world. 8. Seriously, don’t mess with those machines. 9. They’re not even nice to look at. 10. 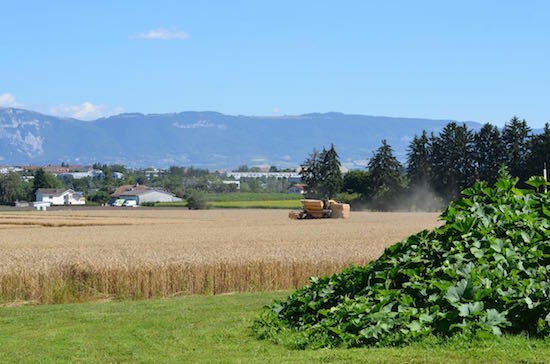 The machines are so big you have to drive through the French countryside to get from one side to the other. 11. 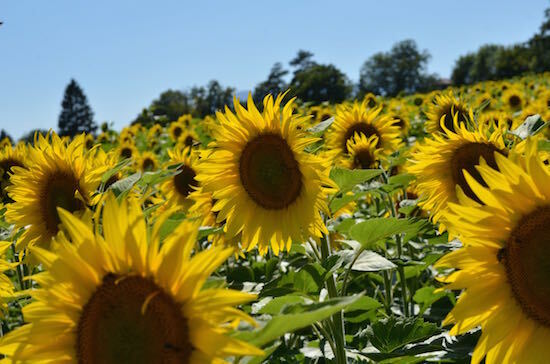 There’s nothing beautiful about the French countryside. 12. 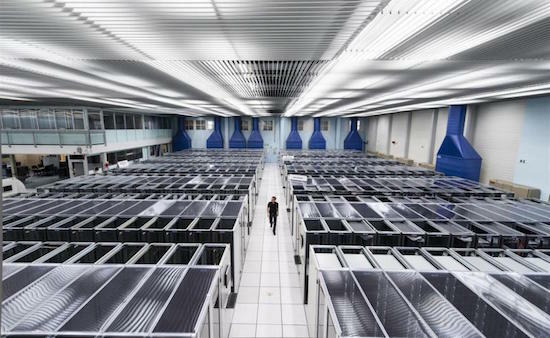 And there’s nothing cool about working on the world’s biggest computing grid with some of most powerful supercomputers ever created. 13. 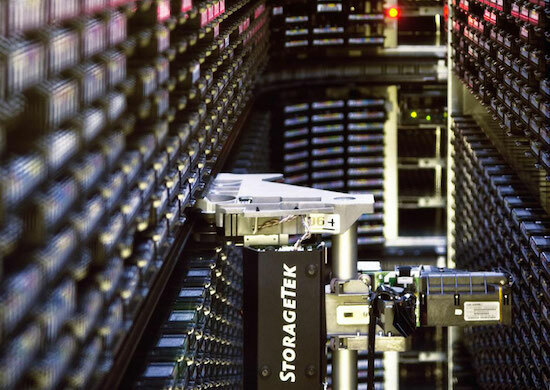 A dataset so big you can’t fit it all in one place? Please. 14. So you can do your analysis from anywhere in the world? Lame! 15. And our conferences always take place in strange places. 16. Who has time to travel? 17. 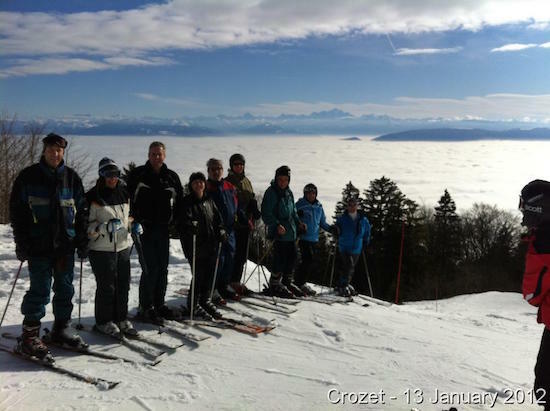 Some people even take time away from the lab to go skiing. 19. But particle physics is only about understanding the universe on the most fundamental level. 20. 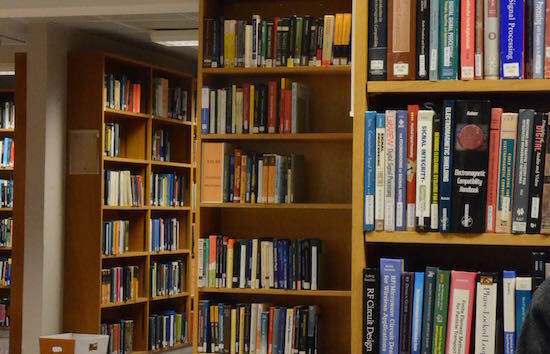 We don’t even have a well stocked library to help us when things get tough. 21. Or professors and experts to explain things to us. 22. And the public don’t care about what we do. 23. Even the press don’t pay any attention. 24. And who wants to contribute to the sum of human knowledge anyway? 25. There’s nothing exciting about being on shift in the Control Room either. 26. Or travelling the world to collaborate. 27. Or meeting hundreds of people, each with their own story and background. 28. You never get to meet any interesting people. 29. And physicists have no sense of humour. 30. Honestly, who would want to be a physicist? Last week I was at a family reunion where I had the chance to talk to one of my more distant relations, Calvin. At 10 years old he seems to know more about particle physics and cosmology than most adults I know. We spent a couple of hours talking about the LHC, the big bang, trying to solve the energy crisis, and even the role of women in science †. It turns out that Calvin had wanted to speak with a real scientist for quite a while, so I agreed to have a chat next time I was in the area. To be honest when I first agreed I was rolling my eyes at the prospect. I’ve had so many parents tell me about their children who are “into science” only to find out that they merely watch Mythbusters, or enjoyed reading a book about dinosaurs. However when I spoke to Calvin I found he had huge concentration and insight for someone of his age, and that he was enthusiastically curious about physics to the point where I felt he would never tire of the subject. Each question would lead to another, in the meantime he’d wait patiently for the answer, giving the discussion his full attention. He seemed content with the idea that we don’t have answers to some of these questions yet, or that it can take decades for someone to understand just one of the answers properly. The road to being a scientist is a long one and you’ve got to really want it and work hard to get there, and Calvin has what it takes. All this made me think about my own experiences on the way to university, and I’m sure everyone had their own memories of the teachers who inspired them, and the frustrations of how much of high school focuses on learning facts instead of critical thinking. At primary school I had exhausted the mathematics textbooks very early on, under the guidance of Maggie Miller. From there Mark took over and taught me puzzles that went beyond anything I was taught in maths classes at high school. It was unfortunate that I was assigned a rather uninspiring maths teacher who would struggle to understand what I said at times, and it took the school about four years to organise classes that stretched its top students. This was mostly a matter of finding the resources than anything else; the school was caught in the middle of a regional educational crisis, and five small schools were fighting to stay open in a region that could only support four larger schools. One of the schools had to close and that would mean a huge upheaval for everyone. Challenging the brightest students became one of the ways that the school could show its worth and boost its statistics, so the pupils and school worked together to improve both their prospects. Since then the school has encouraged pupils to on extra subjects and exams if they want to, and I’m glad to stay that not only has it stayed open but it’s now going from strength to strength, and I’m glad to have played a very small part in that success. By the time I was at college there was a whole new level of possibilities, as they had teams dedicated to helping students get to university, and some classes were arranged to fit around the few students that needed them, rather than the other way around. Some of the support still depended on individuals putting in extra effort though, including staff pulling strings to arrange a visit to Oxford where we met with tutors and professors who could give us practice interviews. I realised there was quite a coincidence, because one of the people who gave a practice interview, Bobbie Miller, was the son of Maggie Miller, one of my primary school teachers. At the same time one of my older and more dedicated tutors, Lance, had to take time off for ill health. He invited me and two others over to his house in the evenings for extra maths lessons, some of which went far beyond the scope of the syllabus and instead explored critical and creative mathematical thinking to give us a much deeper understanding of what we were studying. After one of my exams I heard the sad news that he’d passed away, but we knew that he was confident of our success and all three of us got the university positions we wanted, largely thanks to his help. Unable to thank Lance, I went to visit Maggie Miller and thanked her. It was a surreal experience to go into her classroom and see how small the tables and chairs were, but it brings me back to the main point. 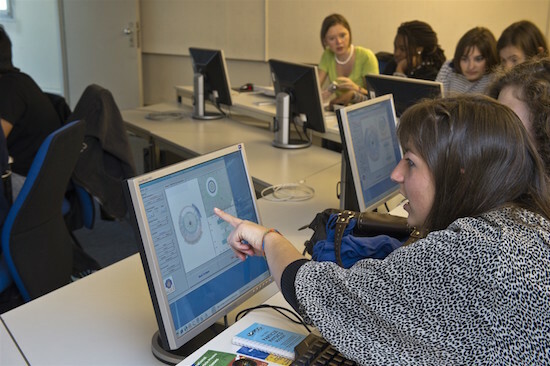 Finding tomorrow’s scientists means identifying and encouraging them from an early age. 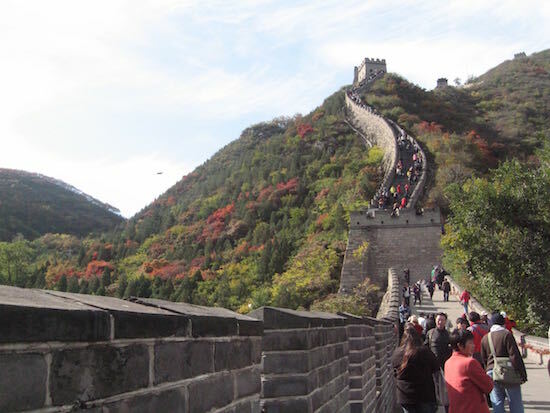 The journey from primary school to university is long, hard, full of distractions and it’s easy to become unmotivated. It’s only through the help of dozens of people putting in extra effort that I got to where I am today, and I’m going to do what I can to help Calvin have the same opportunities. Looking back I am of course very grateful for this, but I also shudder to think of all the pupils who weren’t so lucky, and never got a chance to stretch their intellectual muscles. It doesn’t benefit anyone to let these children fall through the cracks of the educational system simply because it’s difficult to identify those who have the drive to be scientists, or because it’s hard work to give them the support they need. Once we link them up to the right people it’s a pleasure to give them the support they need. 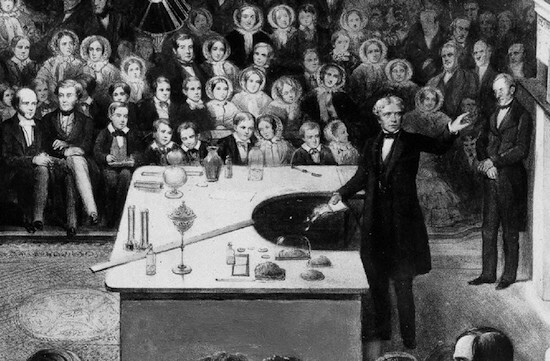 There have always been scientists who have come from impoverished or unlikely backgrounds, from Michael Faraday to Sophie Germaine, who fought hard to find their own way, often educating themselves. Who knows how many more advances we would have today if more of their contemporaries had access to a university education? In many cases the knowledge of children quickly outpaces that of their parents, and since parents can’t be expected to find the right resources the support must come from the schools. On the other hand there are many parents who desperately want their children to do well at school and encourage them to excel in as many subjects as possible (hence my initial skepticism when I first heard Calvin was “into science”.) This means that we also need to be wary of imposing our own biases on children. I can talk about particle physics with Calvin all day, but if he wants to study acoustic engineering then nobody should try to dissuade him from that. Nobody has a crystal ball that can tell them what path Calvin will choose to take, not even Calvin, so he needs the freedom to explore his interests in his own way. 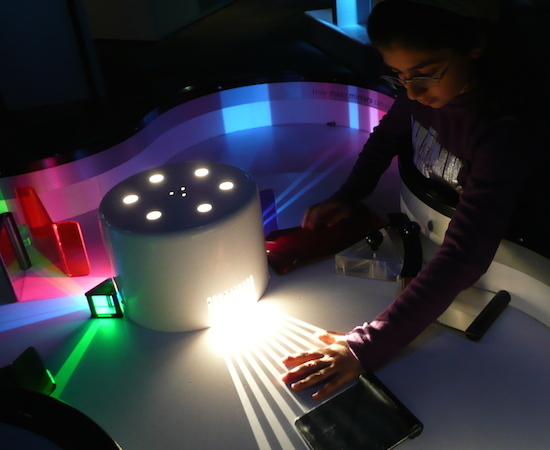 So how can we encourage young scientists-in-the-making? It can be a daunting task, but from my own experience the key is to find the right people to help encourage the child. Finding someone who can share their joy and experiences of science is not easy, and it may mean second or third hand acquaintances. At the same time, there are many resources online you can use. Give a child a computer, a book of mathematical puzzles, and some very simple programming knowledge, and see them find their own solutions. Take them to museums, labs, and universities where they can meet real scientists who love to talk about their work. The key is to engage them and allow them to take part in the process. They can watch all the documentaries and read all the science books in the world, but that’s a passive exercise, and being a scientist is never passive. If a child wants to be an actor it’s not enough to ask them to read plays, they want to perform them. You’ll soon find out if your child is interested in science because they won’t be able to stop themselves being interested. The drive to solve problems and seek answers is not something that can be taught or taken away, but it can be encouraged or frustrated. Encouraging these interests is a long term investment, but one that is well worth the effort in every sense. Hopefully Calvin will be one of tomorrow’s scientists. He certainly has the ability, but more importantly he has the drive, and that means given the right support he’ll do great things. † “Girls aren’t good at science!”, Calvin said. So I told him that some of the best physicists I know are women. I explained how Marie Curie migrated from Poland to France about a century ago to study the new science of radioactivity, how she faced fierce sexism, and despite all that still became the first person in history to win two Nobel Prizes, for chemistry and physics. If a 10 year old thinks that only men can be good scientists then either the message isn’t getting through properly, or as science advocates we’re failing in our role to make it accessible to everyone. 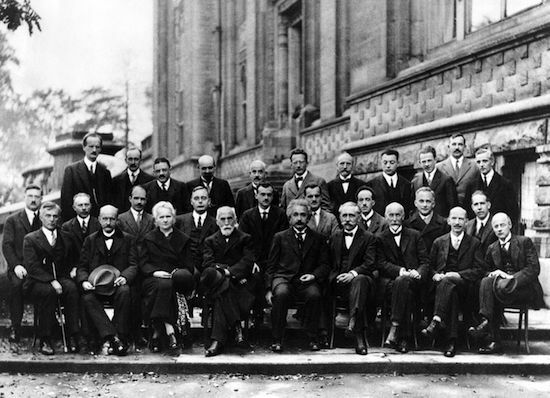 We need to move beyond the images of Einstein, Feynman, Cox, and Tyson in the public image of science. 1st April 2014. 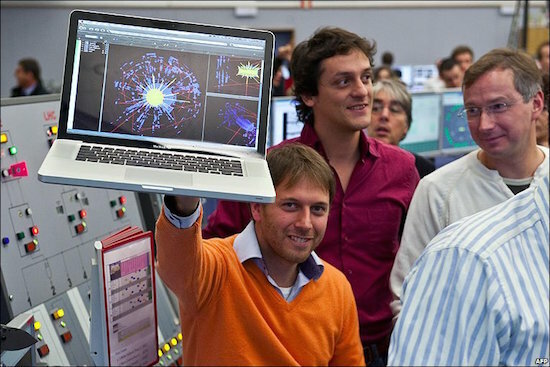 The LHC is currently in shutdown in preparation for the next physics run in 2015. However the record breaking accelerator is danger is falling far behind schedule as the engineers struggle with technical difficulties 100m below ground level. The first indications of problems were identified coming from Sector 7 between areas F and H. Cryogenics expert, Francis Urquhart said “My team noticed dents in the service pipes about 50cm from the floor. There was also a deposit of white fibrous foreign matter on some of the cable trays.” The pipes were replaced, but the damage returned the following day, and small black aromatic samples were found piled on the floor. These were sent for analysis and after chemical tests confirmed that they contained no liquid Helium, and that radiometry found they posed no ionisation risk, they were finally identified as Ovis aries depositions. Ovis aries are found throughout the CERN site, so on-site contamination could not be ruled out. 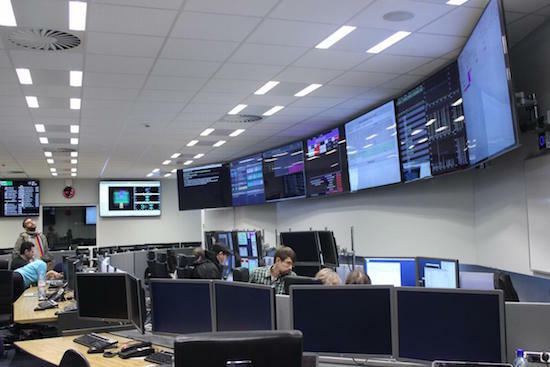 It is currently thought that the specimens entered the Super Proton Synchrotron (SPS) accelerator and proceeded from the SPS to the LHC, leaving deposits as they went. The expert in charge, Gabriella Oak, could not be reached for comment, but is said to be left feeling “rather sheepish”. Elsewhere on the ring there was another breach of the security protocols as several specimens of Bovinae were found in the ring. The Bovinae are common in Switzerland and it due to their size, must have entered via one of the service elevators. 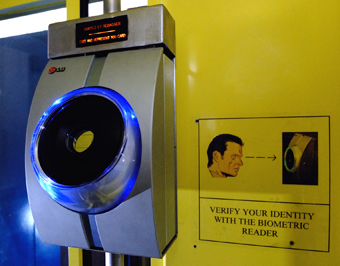 All access points and elevators at the LHC are carefully controlled using biometry and retinal scans, making unauthorised entry virtually impossible. Upon being asked whether the Bovinae had been seen scanning their retinae at the security checkpoints, Francis Urquhart replied “You might very well think that. I could not possibly comment.” While evidence of such actions cannot be found CCTV footage, there have been signs of chewed cud found on the floor, and Bovinae deposits, which are significantly larger than the Ovis deposits, owing to the difference in size. 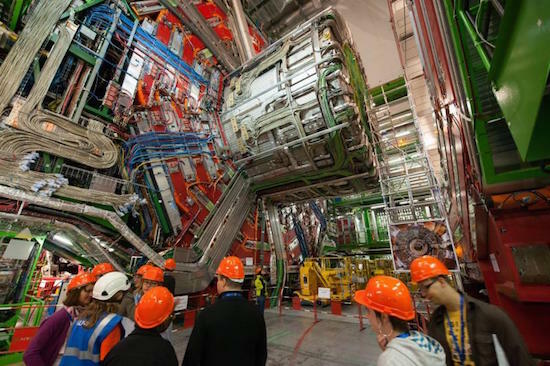 The retinal scans at the LHC are designed exclusively for human use. A search of the biometric record database show at least one individual (R Wiggum) with unusual retinae, affiliated to “Bovine University”. 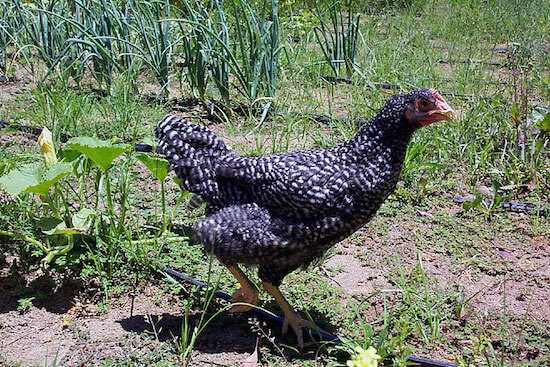 This is not the first time a complex of tunnels has been overrun by farm animals. In the early 90s the London Underground was found to be infested with horses, which turned into a longterm problem and took many years to resolve. “Welcome to CMS,” my friend said, “it’s exactly the same as ATLAS, except the fluctuations are downward.” It was a light hearted, almost flippant remark and to an extent it summarised my feelings about the two experiments. 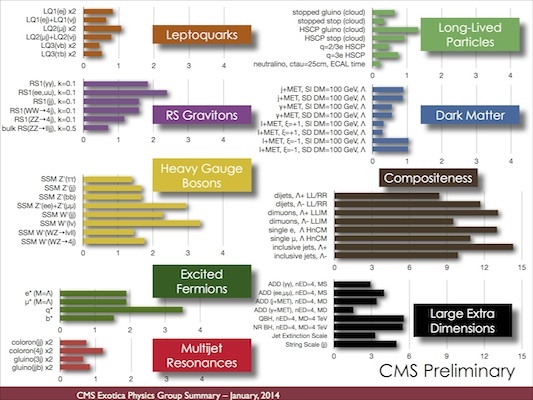 So when I moved from the ATLAS experiment to the CMS experiment the biggest changes were not related to the physics. After all, we see the same physics, publish very similar results and analyse the same beams colliding over and over again. 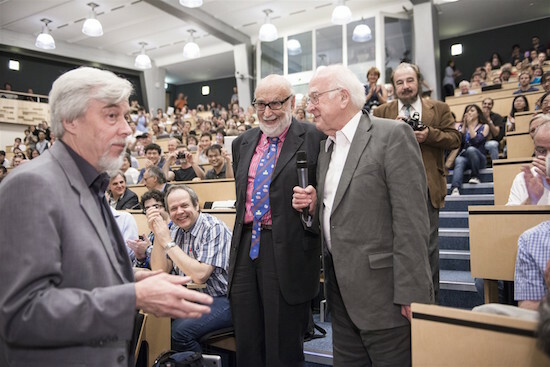 The big news that both experiments celebrate the most is, of course, the new boson. ATLAS saw a little more events than they expected in the main channels, and CMS saw a little fewer, and otherwise they both saw the same effect, confirming that it was real. Same experience, different detectors. Nothing really changes! What really changes is everything surrounding the work. 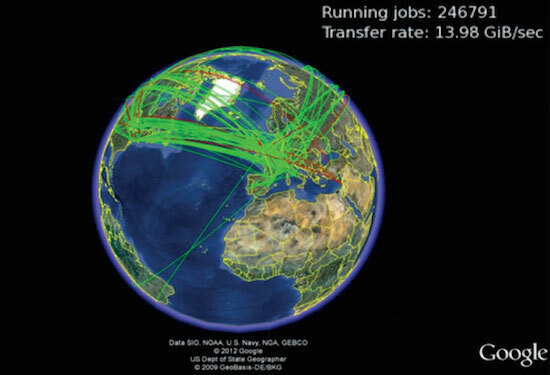 I’ve moved across the world a few times to follow my career, first to California where we analysed collisions at SLAC, and then to CERN to work on ATLAS. This time I moved to ULB in Brussels, the capital of Europe, and that meant a new home, a new nation, a new university, and a new experiment. In fact the only thing that stayed the same were the protons. For me that’s perfect, after all the last thing I want to do is stagnate, doing the same thing day after day. A change like this is refreshing, gives a chance to open up new horizons and reinvent oneself a little. Having those tiny little protons be the only source of continuity is actually quite reassuring in a way. That’s what I’m here for, after all. To keep studying those protons I’ll let everything else around me change and welcome the state of flux. So as well as all those “auxiliary” changes I decided to change the physics topic as well. 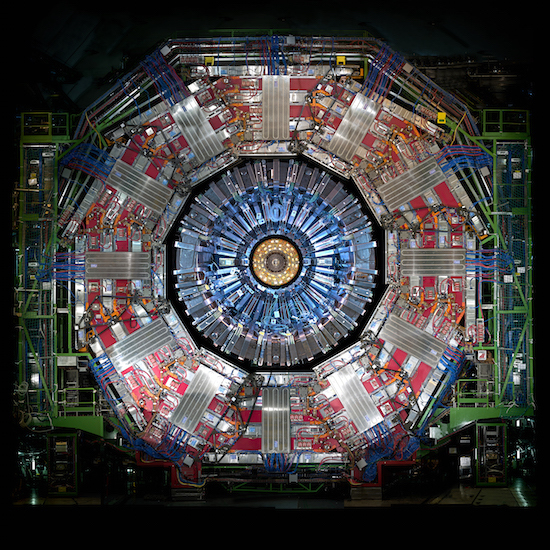 I have previously searched for the Higgs boson, starting up and leading a new analysis from scratch before handing it over to the ATLAS machine. This time I’m looking for the Z prime boson, which has a clean signature and if it is seen, it is seen very soon after taking new data. 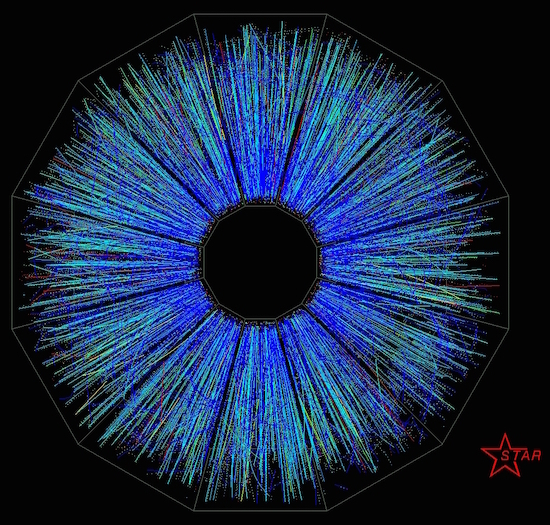 There are several models out there, but given the relative ease and speed of discovery it’s more a matter of “Find now, ask questions later!” Within the first few weeks of taking data we will be poring over the results, looking for any hints of new physics, competing in a head to head race with ATLAS and with each other to find the peak first. 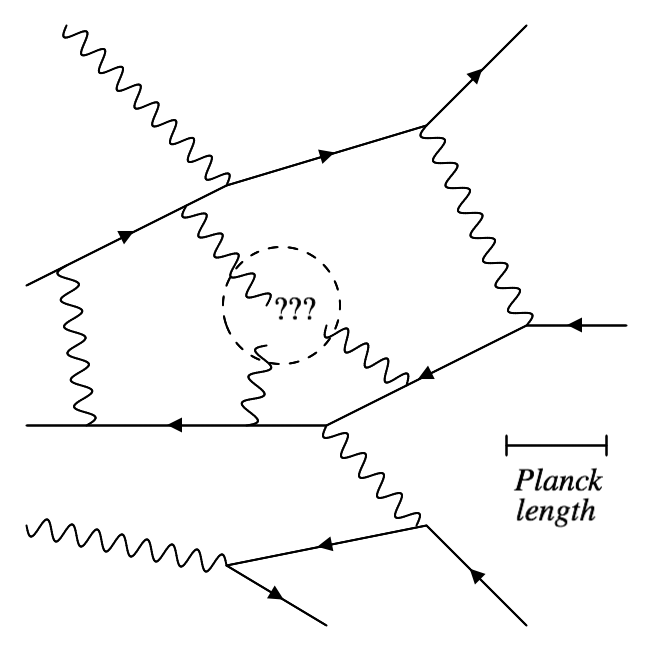 If if exists, we’ll find it, and it’ll shake our view of physics at the TeV scale. This is a very different kind of physics for me, and at first it was not I felt particularly comfortable pursuing. I was used to having an airtight model that told me what to expect and how much of it to expect and even where to expect it. This time the data is telling the story and that’s a tricky idea to get used to. Then again this whole transition is about changing my outlook, so why not change analysis style too? 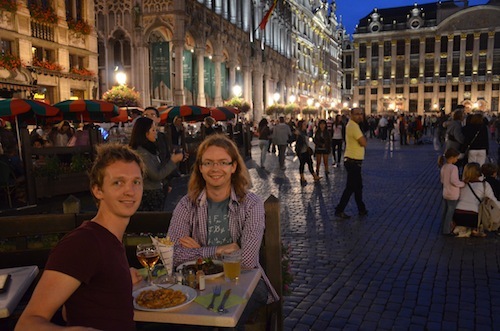 Finding the best table in Brussels and having dinner with a visiting friend. 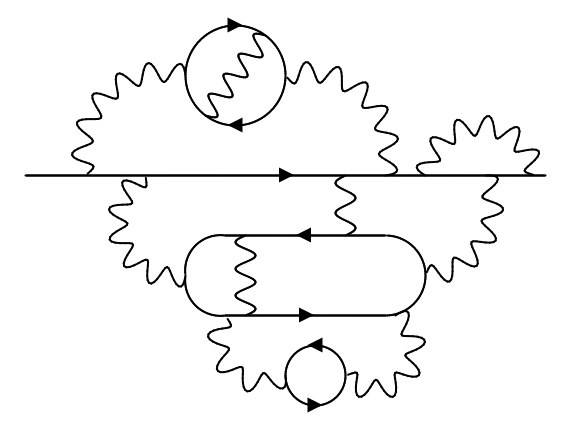 The way I see it, moving experiment is just like a gauge transformation. No matter what happens, any physical phenomenon must be the same after a gauge transformation. 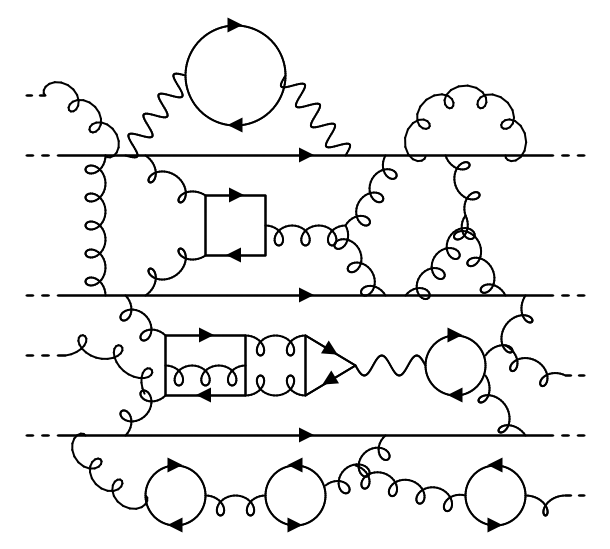 This kind of transformation is a subtle mathematical change that has no classical analog. By making a phenomenon gauge invariant we can introduce new forces that mop up all the differences, so that ultimately, we all see the same thing, no matter how we look at it. 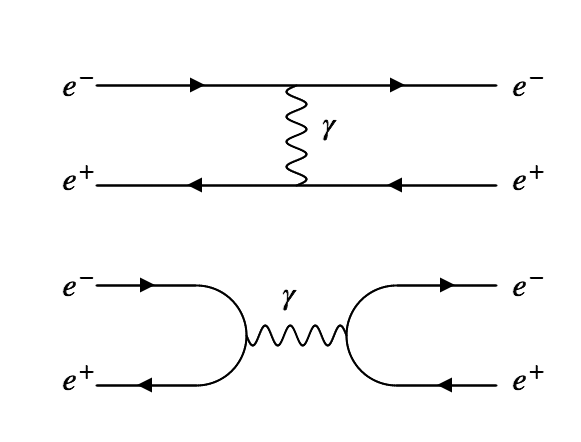 In this case, what stays the same is the underlying nature of those colliding protons. That’s the gauge invariance, and everything else, the movement from place to place, from one experiment to another, are just the fields swooshing about as we perform our own personal gauge transformations. It turns out life is complex.